Taking cooking classes while traveling is never easy for me. They are often geared towards a casual cook who needs something to do on vacation besides museums and monuments. SkyKitchen would satisfy such a traveler, but it was also wonderful for people who love to cook. Lucky for me, all the students in my class were passionate cooks and really wonderful people to spend a day with. Emma, the investment banker from London, took 3 months off to explore South America. She just came out of the jungle and found the urban luxuries of Lima to be a huge relief. Sarah from Copenhagen just finished her University degree and was travelling through South America for 6 months. Paco, a researcher from Mexico City, tagged along with his wife who was at a conference in Lima. He couldn’t pass up an opportunity to revisit Lima’s gastronomy and spent all his days in cooking classes, markets, and restaurants. We started with a tour of Surquillo market where our guide Diana told us about the great variety of fruits and vegetables available in Peru. Then we headed to the open air kitchen located on a roof terrace above Yurak’s apartment. We got to taste at least 30 different fruit while Yurak and his 2 helpers got us ready for a seafood cooking class. Our menu included 3 types of causa, 2 types of ceviche, and escabeche. We learned all about different types of chilis used in Peruvian cooking. What Peruvians do with chilis is really cool for spice wimps like me. They remove the seeds (the spicy part) and boil the peppers in a few changes of water. This removes the heat further. The peppers are then peeled and pureed. The resulting sauce is flavorful with a warming mouthfeel without any burn. Does it taste like bell pepper? No. These peppers have their own unique tastes. We mixed these purees into mashed potatoes to give them beautiful colors for causas. We also used a combination of many different chili purees for our escabeche dish (cooked fish in a tangy sauce). The stuffings and toppings for our causas were octopus, shrimp, and smelts. All three were delicious, but the causa with smelts was my favorite. After we mastered the ceviche, we moved on to its great grandfather -- escabeche. Escabeche is the Spanish dish of cooked fish cured in marinade that was the basis for peruvian ceviche. But as all dishes this one evolved and Peruvian version of escabeche is very different from Spanish. We floured and fried the fish (the same one we used for ceviche -- corvina). Then we made a very flavorful sauce with garlic, oregano, 3 different chili pastes, fish stock, wine, vinegar, and onions. We added the fried fish to this sauce and gently braised it until the flour in the fish thickened the sauce a bit and all the flavors came together. Escabeche is a homey dish, but lovely and comforting. 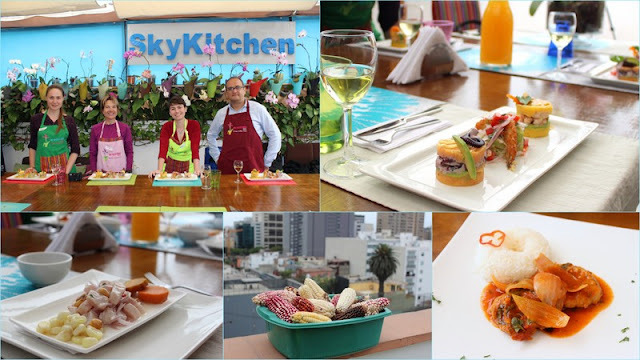 I am a tough customer to please in a cooking class, but I loved Sky Kitchen. The staff was really dedicated to getting us to succeed with these dishes at home. They told us about the alternatives to using fresh Peruvian chilis (since they are not available in our respective countries). There are ready to use pastes we can buy on Amazon and in Latino markets. They even gave us little packets of chili pastes to take home with us. We got recommendations on potato types to use for causas in Europe and in North America (Peru has thousands of potato types not available in the rest of the world). We got to eat all of our creations surrounded by flowers overlooking Lima. What did we talk about? Our next meal, of course. Unfortunately Emma was leaving Lima the next day. But Paco, Sarah, and I got together the following day with chef Hector, who was Paco’s instructor for another cooking class. After I got over my difficulty dealing with the fact that no one in Latin America shows up to things on time, we finally found each other at our meeting spot at Surquillo Market. It was worth the wait. Hector took us to a hole-in-the-wall I would be too nervous to try by myself and it turned out to be one of the best meals with the best company. We thought we couldn’t eat anymore when we stumbled out of Don Cevichero, but then Hector disappeared before we had a chance to say good bye. We were looking around the cooking tool section of the market when he popped back up with a plate of picarones -- the squash and sweet potato donuts. “Is the syrup just sugar?” I asked, carefully trying to avoid it. Hector gave me an are-you-kidding look. “Of course not,” he replied. “It’s fig syrup with cloves and spices.” I am not a big clove person, but I am a big fig person, so gave it a try. Yum! Sweet and tangy and so good that the whole plate of picarones was gone in less than 30 seconds in spite of our protests that we were completely full.